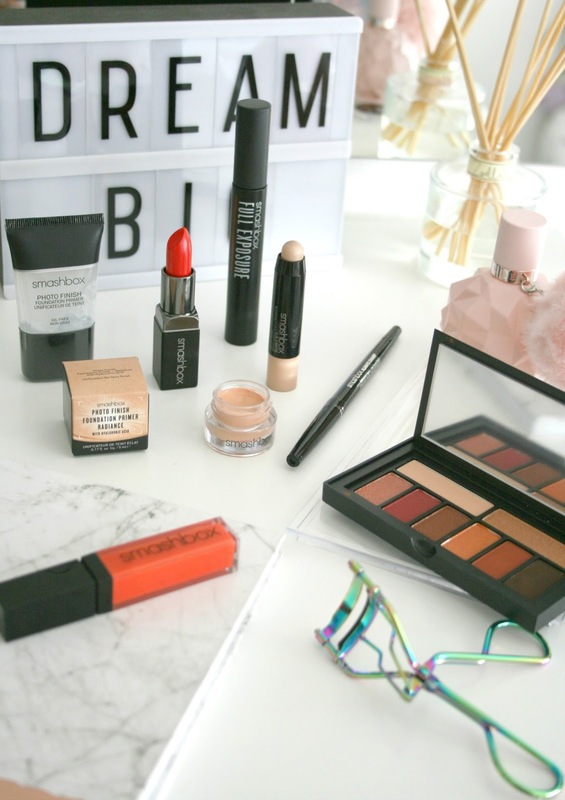 In the January Sales I picked up the Smashbox Studio Best Sellers Set which contained a mini Phot Finish Primer, Lipstick, Kohl Liner, Mascara and Highlighter. So lets start with that shall we!? Like I mentioned the Photo Finish Primer is my absolute favourite so I'm glad to be able to add another spare one to my collection, this is a mini sized one and I must say it is quite adorable. With this primer I find it gives me a real smooth base to apply my foundation on top of and it helps foundation just sit real natural on my skin. It also helps my makeup last all day and I honestly cannot fault it whatsoever. The lipstick they included in the set is in the shade 'Fired Up' which is the most gorgeous red shade I've ever laid my eyes on. It's in between a deep and bright red, it's not so much a Snow White red when on your lips but still deep enough for it to be your statement piece. What actually made me buy this set was the full sized Full Exposure mascara. I had a mini version of this that I was using for a solid month and was really enjoying it and had decided to buy a full size. However this set (with staff discount) ended up working out at the price of the mascara so it was a win win situation really. I absolutely adore this mascara, the wand is quite thick but it seems to separate my lashes and the product itself helps them look longer and bolder than what they actually are. The highlighter chubby stick is probably my least used product out of the whole set only because it's a cream product and I much prefer powder highlighters. But I have been using it every now and then and it is a gorgeous champagne shade and does give you a glow! However I'm just not a big fan of cream highlighters so literally thats the thing that puts me off, the colour like I said though is absolutely stunning. Finally their Kohl Liner which is always Sharp. It actually fascinates me. There is a built in sharpener in the lid of the product so when you twist the lid onto the product it's actually sharpening it aswell so it's always ready to be used straight away. Like I was literally blown away by this invention and think it's such a convenient thing that all eye liners should have it. Moving onto one of their latest releases, a brand new primer! Like I said Smahbox has been my go to brand for primers for the past two years. I got a sample of their new Radiance primer and fell head over heels in love with it so much so that spoiler alert - I bought the full sized product a few days after I took this photo! The Radiance primer has a tint to it which I like as I feel like it's almost giving you that little more extra coverage. As the name would suggest it adds radiance to the skin and they really nailed the perfect in between! It doesnt look like you've chucked a load of glitter on your face and just gives a nice healthy glow to your complexion. They've also added Hyaluronic Acid to the formula meaning it's beyond hydrating on the skin and great for those of us who suffer with dry skin! I also picked up a gloss, this was a freebie and was part of a set not entirely sure if you can buy this on it's own. I'm not a huge fan of glosses as I hate the feel of them on my lips however they've kind of nailed their formulas here as this isn't too sticky or tacky and the Orange shade is divine. I dont know what it is about orange lip shades but I just fall head over heels for it. It's also very pigmented and the full colour intensity is there, it's not one of those when you put it on the colour is so sheer that you're left wondering why they even bothered trying. Finally the main attraction. Smashbox have launched a set of eyeshadow palettes in collaboration with Shay Mitchell and as soon as I seen them on Instagram I knew there was one palette I needed in my life asap! I picked up the 'Ablaze palette' filled with burnt oranges, burgundy and golds. It is everything you need in a palette I honestly cannot get enough of it. This was the first eyeshadow palette let alone any eyeshadow I tried from Smashbox and dear lord are they mesmerising. I have a whole post coming soon just dedicated to this palette! It is blindingly pigmented, blends like a dream and just looks absolutely stunning. Since trying all these products out and realising just how great everything is makes me excited to try more from the brand. I think next on the list will be a foundation for sure! What Smashbox products do you love?